This hammered stainless steel holder fits over standard deli containers, making the less-than-attractive plastic instantly better looking. 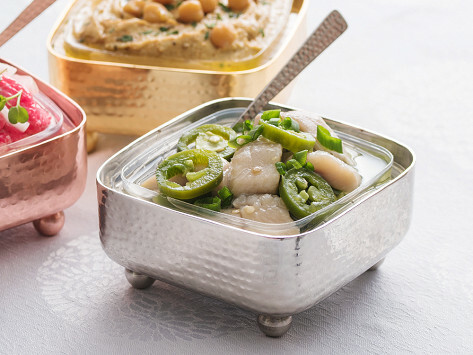 Dips, spreads, salads, and more stay put in their container while the holders dress them up. It sidesteps the need to transfer food into serving dishes, which means less clean-up, too. Dimensions: 4.60" x 4.60" x 2.20"
Hershy Kirsh from The Decorizer was used to hosting large family get-togethers, but was over all the cleanup. So he and his wife came up with a way to sidestep some of the dirty dishes, while elevating the look of their spread. The solution? Stealthy holders that fit over standard deli containers. 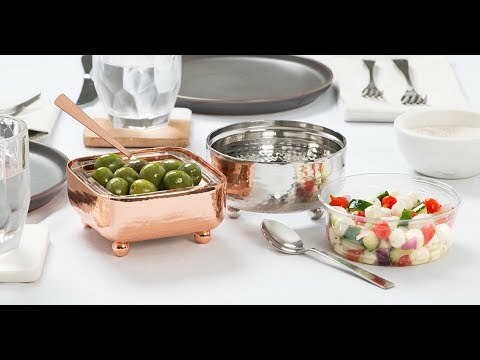 Now dips, spreads, and salads are elegantly presented (thanks to the holder’s hammered, stainless steel finish) without having to be transferred out of their containers. You don’t have to serve up unsightly plastic containers and there’s less cleanup—and that all sounds like a hosting win to us.